Raising Vegetarian Kids? Here Are Some Pointers A vegetarian diet can be healthy for kids, but parents need to learn nutrition basics to make sure their children get all of the nutrients they need, experts say. Iron is the nutrient vegetarians and vegans most often don't get enough of. 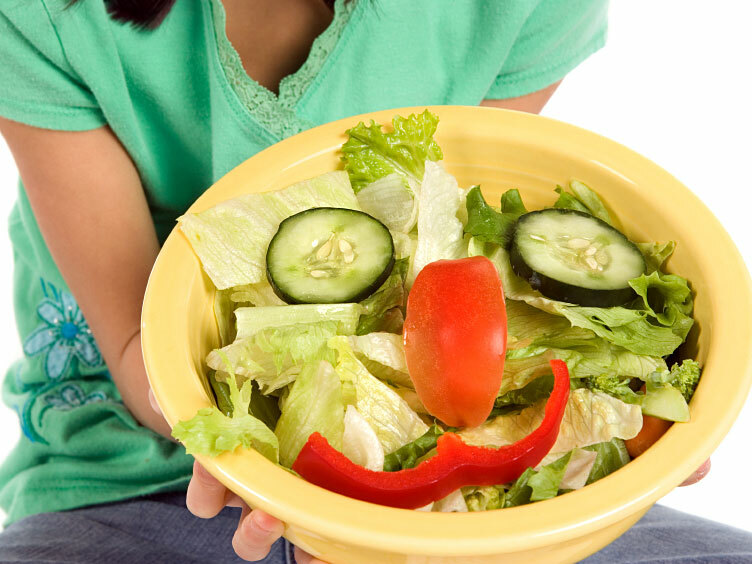 Vegetarianism among kids has gone more mainstream in the past decade. A nationwide survey by the Vegetarian Resource Group found that 3 percent of American youth, or about 1.4 million people between ages 8 and 18, are vegetarian; that is, they avoid meat, fish and poultry. That's up from 2 percent 10 years ago. Celebrities' meat-free preferences may be helping to popularize it: Carrie Underwood, Joaquin Phoenix and Christian Bale (although he says he's not as adherent as he used to be) all famously chose the vegetarian path in their youth. Experts recommend that parents consult with a nutritionist to make sure vegetarian children get what they need. In some cases, parents who are already vegetarian decide to raise their kids the same way, says Reed Mangels, a registered dietitian and nutrition adviser for the Vegetarian Resource Group. Other parents start thinking more about heath and diet once they have children and cut out meat later on. Whatever the motivation, the American Dietetic Association says vegetarianism can benefit kids: In a policy statement the ADA points to research showing that vegetarian kids and teens take in less cholesterol, saturated fat and total fat and eat more fruits, vegetables and fiber. At the same time, there are some things that parents of vegetarian kids should keep in mind to be sure their kids get the nutrition they need. "Vegetarianism can be conducive to a healthy lifestyle, but you have to balance out what you omit," says Dr. Jatinder Bhatia, chairman of the American Academy of Pediatrics' committee on nutrition. Iron is the most common nutrient deficient in vegetarians, and especially in vegans, who don't eat any animal products, the American Academy of Pediatrics' Pediatric Nutrition Handbook says. That's because iron-rich plants contain a type of iron that's harder for the body to absorb than the iron found in animal products. If the child's pediatrician isn't aware that the child is a vegetarian, the doctor may not know to test for iron deficiency, Bhatia says. Iron deficiency may not become apparent until the child is older, Bhatia says, and at that point, the child may actually have irreversible cognitive defects. The more restricted the diet, the more difficult it is for vegetarian children to get all of the nutrients they need. Bhatia says lacto-ovo vegetarians -- those who won't eat meat, fish and poultry but will eat dairy and eggs -- are at the least risk for undernutrition. Vegan children, a small but growing group, are another story. Vitamin B-12 is found naturally only in animal products, and vegans may also be at risk for insufficient intake of vitamin D, calcium, zinc and riboflavin. Dr. Morey Haymond, chief of pediatric endocrinology and metabolism at the Texas Children's Hospital and Baylor College of Medicine, says some cultures where vegetarian diets are commonplace — particularly in East Asia — have established ways to compensate for potential deficiencies. For example, vegetarians need to ensure they get "complete" proteins; that is, they need to get all of the essential amino acids, which are the building blocks of protein. Complete proteins are found in things like meat, fish and eggs. By itself, the only complete protein that comes from plants is found in soybeans. "You need to balance legumes [like beans or lentils] with other starches or with other vegetables" to come up with a complete protein source, he says. That's why staples like rice and beans are a great combination, he says. Rice and beans are a traditional diet in the Americas. But he says people unfamiliar with balanced vegetarian diets may not have the background to plan their children's diets to ensure they're getting essential nutrients. "I think anytime when it's not part of the family's culture that they need to seek some professional advice to make sure," Haymond says. "I think it's very difficult to healthfully raise a vegan child," says Rebecca Roach, a registered dietitian and teaching associate at the University of Illinois' Department of Food Science and Human Nutrition. "It can be done, but it needs to be someone who really understands the nutrient needs for their child." Mangels says there are two mistakes that newly minted vegetarian parents can make. First, parents worry that their children aren't getting enough protein and overcompensate. They end up feeding their children a diet that is too high in saturated fat and calories as a result. Another mistake they make, she says, is just taking the meat off the plate without replacing it with anything. "You need to think about beans or some soy products or low-fat dairy products," Mangels says. For those looking to make the switch, pediatricians and dietitians recommend that parents consult with a nutrition expert. "Just because you switch to vegetarianism doesn't mean you know what to eat," Bhatia says. Compensating for possible nutritional deficiencies could be as simple as looking for plant sources of vitamins and minerals that are missing. For example, instead of eating meat to get protein and iron, soybeans might do the trick. To get enough riboflavin, vegans can opt for asparagus or broccoli. As for zinc, the National Institutes of Health says that nonmeat sources of zinc are more difficult for people to absorb. One way to make plant zinc more absorbable, they say, is by "soaking beans, grains, and seeds in water for several hours before cooking them and allowing them to sit after soaking until sprouts form." They also say that consuming leavened grain foods, like bread, helps the body to better absorb the zinc, compared with unleavened grain foods, like crackers. Consuming fortified foods might also help meet a child's nutritional needs. Bhatia says DHA, an omega-3 fatty acid found in certain types of fish, is important for brain and vision development in young children. But getting enough of it can be tough for kids, vegetarian or not and DHA-fortified foods and juices can help. Katie Kavanagh, a registered dietitian and professor at the University of Tennessee in Knoxville, advises serving vegetarian children fortified foods to make up for vitamins and minerals -- like calcium, vitamin B-12 or vitamin D -- that could be lacking in kids' diets. "Many of those are pretty easy to find these days in products like soy milk or orange juice," she says. Kavanagh, who is raising her two children vegetarian, says she doesn't have trouble making sure her kids get the nutrition they need. And Mangels says vegetarianism is a lot more visible now than when she became one in the 1970s in northern Florida. Now, movie stars promote vegetarianism, and vegetarian foods aren't just the stuff of "dusty-boot co-ops," she says. "You can go into not only big city grocery stores but even local places for vegetarian products," Mangels says. At the same, Mangels, who raised two vegan daughters, says kids will still be kids. Parents, she says, should be sensitive to their kids needs' and personalities. "If you have a kid who doesn't want to look different from their peers, don't send them to school with strange-looking food," she says. She advises parents who are making the switch to talk to kids about why they're doing it. And she says parents should help their kids find familiar vegetarian foods, like macaroni and cheese, to help make the transition easier on the stomach.